Here’s the notes for episode #058 of The Paleo Women Podcast. Be sure to check back every Tuesday for a new episode, and head over to iTunes or Stitcher to subscribe! 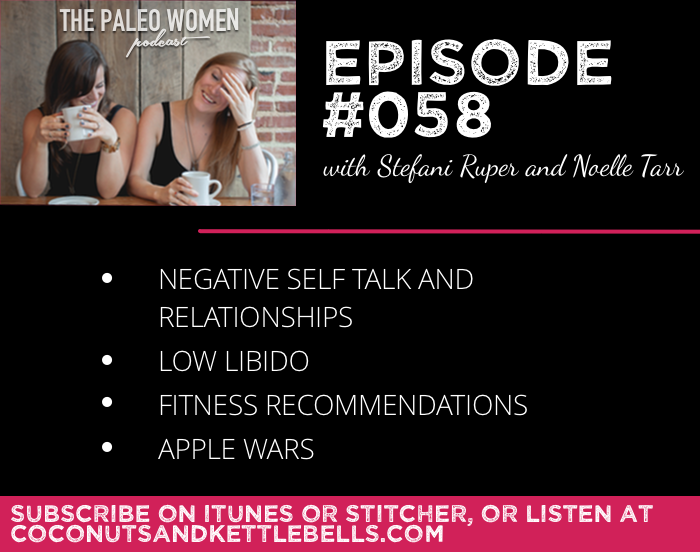 In this episode, Stefani and Noelle discuss negative self-talk and relationships, low libido, our top fitness recommendations, and the apple wars. Yes, there is a war, and it involves apples. To learn about how you can become a NTP or NTC, check out the course catalogs and program information at http://nutritionaltherapy.com. Also, check out information about the Nutritional Therapy Conference. As a special offer, Allison is providing our community with a free 1-month subscription to PrepDish. That’s an amazing deal. To get your free subscription, head over to: http://www.prepdish.com/paleowomenfree to take advantage of this offer.